رفیع شریف آباد, جواد, نوحه گر, احمد, زهتابیان, غلامرضا, خسروی, حسن, غلامی, حمید. (1395). بررسی روند تغییرات کاربری اراضی بر روی کیفیت آّب زیرزمینی دشت یزد-اردکان. فصلنامه جغرافیا ( برنامه ریزی منطقه ای), 25(2), 189-199. جواد رفیع شریف آباد; احمد نوحه گر; غلامرضا زهتابیان; حسن خسروی; حمید غلامی. "بررسی روند تغییرات کاربری اراضی بر روی کیفیت آّب زیرزمینی دشت یزد-اردکان". فصلنامه جغرافیا ( برنامه ریزی منطقه ای), 25, 2, 1395, 189-199. رفیع شریف آباد, جواد, نوحه گر, احمد, زهتابیان, غلامرضا, خسروی, حسن, غلامی, حمید. (1395). 'بررسی روند تغییرات کاربری اراضی بر روی کیفیت آّب زیرزمینی دشت یزد-اردکان', فصلنامه جغرافیا ( برنامه ریزی منطقه ای), 25(2), pp. 189-199. رفیع شریف آباد, جواد, نوحه گر, احمد, زهتابیان, غلامرضا, خسروی, حسن, غلامی, حمید. بررسی روند تغییرات کاربری اراضی بر روی کیفیت آّب زیرزمینی دشت یزد-اردکان. فصلنامه جغرافیا ( برنامه ریزی منطقه ای), 1395; 25(2): 189-199. مدیریت بهینه منابع طبیعی یک منطقه نیازمند درک تأثیرات تغییرات کاربری بر روی چرخه هیدرولوژیکی آب‌های آن منطقه است. هدف از این پژوهش، بررسی روند تغییرات کاربری و اثرات آن بر کیفیت آب زیرزمینی در دشت یزد-اردکان می‌باشد. بدین منظور از داده‌های آب زیرزمینی شامل EC و SAR و همچنین تصاویر ماهواره‌ای در دو بازه زمانی 1375 و 1393 استفاده گردید. برای تهیه نقشه کاربری اراضی دشت یزد-اردکان از شاخص NDVI استفاده شد. نتایج نشان داد که اراضی مرتعی در سال 1393 به میزان 300 کیلومتر مربع نسبت به سال 1375 کاهش یافته است که این اراضی به اراضی شهری و مسکونی تبدیل گردیده است. همچنین نتایج نشان داد که بخش‌های جنوب منطقه دارای بهترین کیفیت آب برای مصارف کشاورزی است و هر چه به سمت شمال دشت یزد اردکان می‌رویم از کیفیت آن برای فعالیت‌های کشاورزی کاسته می‌شود. البته با گذشت زمان نیز از کیفیت آب کاسته شده است و میزان آلودگی در قسمت‌های شمالی و شرقی بیشتر شده است. علت اصلی این پدیده را می‌توان از یک سو گسترش نواحی شهری و فعالیت‌های صنعتی بویژه در شهرستان‌های میبد و اردکان و نیز حفر چاه‌های غیر مجاز و جهت آبیاری درختان پسته در وسعت زیاد دانست که باعث گردیده است اراضی مرتعی به اراضی شهری تبدیل گردد وهمچنین افت سفره وشورشدن آب زیرزمینی صورت گیرد. این شرایط نشان از یک وضعیت هشدار برای اراضی مرتعی است؛ به دلیل اینکه اراضی به کاربری‌هایی تبدیل شده‌اند که خود مسبب افزایش مصرف آب در منطقه مورد مطالعه هستند. Optimum water resources management requires a deep understanding of the impacts of land-use changes on the hydrological cycle of the region of interest. 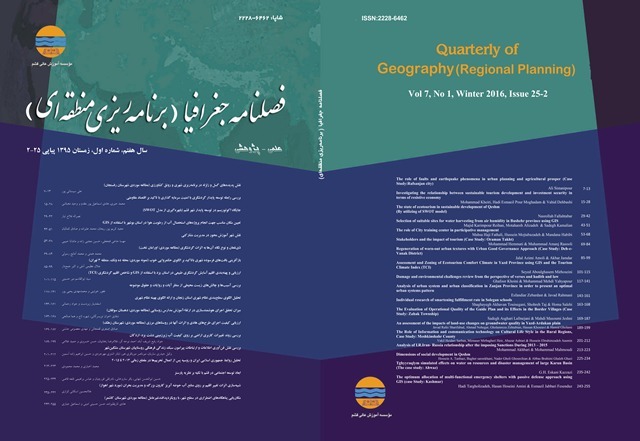 This study set out to make an illustration of land-use changes and its consequents on groundwater quality in Yazd-Ardakan plain. The data series on EC and SAR along with satellite imageries for 1997and 20015 were used to achieve this goal. The NDVI index was used to prepare land-use map for the study area. The results suggested a reduction of 300 Km2 in the area of rangelands during the time, which has been converted to residential and urban areas. It has also been shown that the groundwater quality of the southern parts is of suitable quality for agricultural purposes, and a major reduction could be trended further towards the north. Yet, signs of groundwater quality deterioration are evident especially in the northern and eastern sections. This could be attributed to the expansion of urban areas along with the intensification of industrial activities in Meybod and Ardakan counties, as well as illegal drillings and establishment of Pistachio orchards. The outcome has been shrinking rangeland areas with dwindling groundwater resources which are on the process of heavy salinization. These could be regarded as the symptoms of an alarming situation as the land is being rearranged for the activities which heavily depend on groundwater resource. Dhanasekar­, M., Selvan, P., Chandran, S., & Chandramohan, K. (2015). Land use and land cover dynamic analysis using satellite Remote Sensing and GIS techniques-A case study of Girudhumal river sub basin, Tamilnadu, India. International Journal of Geomatics and Geosciences, 5(4), 579. Mondal, M., Karan, C., & Shukla, J. (2015). Changing Pattern of Land Utilization: Using Remote Sensing and GIS Methods in Moyna Block, Purba Medinipur District, and West Bengal. Journal of Engineering Computers & Applied Sciences, 4(3), 87-96. Nath, V. R., and Helen, H. M. (2013). Evaluation of ground water quality in Neyyattinkara Taluk, Kerala. Journal of Chemical & Pharmaceutical Research,5(4). Pawar. S., Panaskard, B. and V. M. Wagh. (2014).Characterization of groundwater using water quality index of solapur industrial, (case study:Maharashtra, INDIA). International journal of Research in Engineering & Technology, 2(4), 31_36. Rouse Jr, J., Haas, R. H., Schell, J. A., & Deering, D. W. (1974). Monitoring vegetation systems in the Great Plains with ERTS. NASA special publication, 351, 309. Scanlon, B., Reedy, R., Tonestromw, D., Prudicz, D., Dennehy, K. (2005). Impact of land use and land cover change on groundwater recharge and quality in the southwestern US. Global Change Biology. 11, 1577–1593. Uddin, M. N., Anwar, M. F., Rahman, M. T., & Mobin, M. N. (2015). An Investigation on the Pattern of Land Use Change in Dhaka City Using Remote Sensing and GIS Application. Journal of Environmental Science and Natural Resources, 7(2), 105-109. Yanli, Y., Jabbar, M. T., & Zhou, J. X. (2012). Study of environmental change detection using Remote Sensing and GIS application: A case study of northern Shaanxi Province, China. Pol. J. Environ. Stud, 21(3), 789-790.